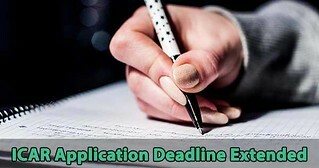 ICAR Application deadline has extended - ICAR stands for Indian Council of Agricultural Research. ICAR registration process for admission to UG, PG and JRF courses started from 18 May 2018. Indian Council of Agricultural Research (ICAR) organizes an entrance exam, which is known as All India Entrance Examination for Admission (AIEEA). The latest news regarding the ICAR AIEEA is that the last date to fill the application form has now been extended. The candidates can now fill the application form until 3 June 2018. Hence, the candidates who have not yet filled the application form are suggested to do so by following the link given on this page. Important points regarding ICAR Application and how to fill the ICAR Application Form is given on this page. How to fill the ICAR Application Form 2018? The candidates who have not yet filled the ICAR AIEEA application form 2018 can do so now by following the link below. The candidates should keep in mind that they are allowed to choose only one Degree course at the time of applying for the application form. The option once executed cannot be changed. There is a common ICAR application form for AIEEA UG, AIEEA PG and Doctoral (PGS) Programme. Steps to fill the application form of ICAR are given below. The candidates have to follow the link given on this page to fill the ICAR AIEEA application form. Before filling up the form, the candidates have to select the programme they are applying for, choose exam centre and finally fill the ICAR AIEEA application form. After that, the candidates have to upload their photo, signature and thumb impression. At last the candidates have to make the payment of the application fee and submit the application form. The last date to fill and submit the application form has been extended and is 3 June 2018. The candidates can now fill the application form till this date. ICAR AIEEA application form can be filled in online mode only, there is no procedure to fill the offline application form. A candidate is allowed to submit only one application. If a candidate submits more than one application, his/her candidature shall be cancelled. The candidates should not send the hard copies of the application to ICAR office, there is no need of that. The candidates after filling up the application form should take a printout of the application form and keep it safe for future use.